Progressive Labs Cardiovascular Support - BP Natural - 120 Capsules. 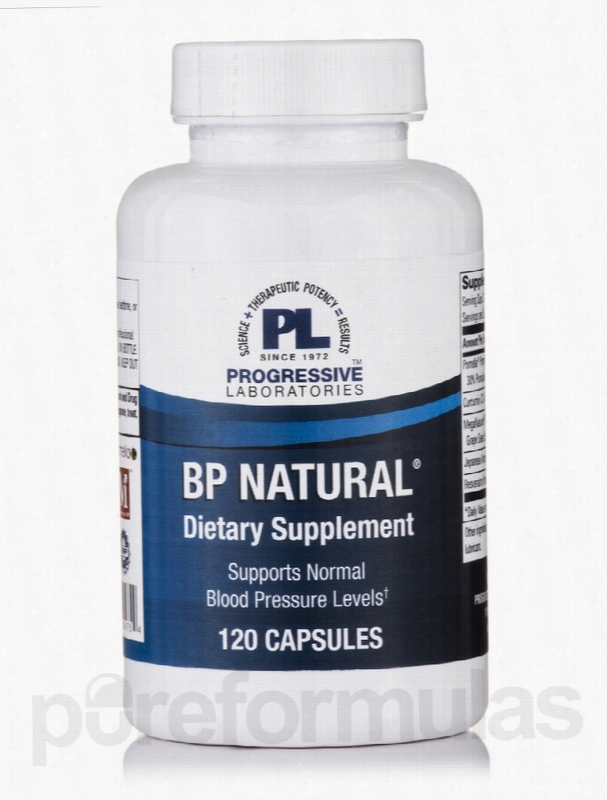 Progressive Labs' BP Natural is a nutritional cardiovascular supplement formulated with several innovative and time-honored ingredients that may address certain cardiovascular health issues like blood pressure and endothelial function. Some of these ingredients include: Pomella&reg; Pomegranate Extract Pomegranate extract has been receiving a lot of attention lately. This is so specifically because recent research suggests that pomegranates (in addition to their other health benefits) could contain more antioxidants than green tea or possibly even blueberries. Progressive Labs is proud to feature Pomella&reg; Pomegranate Extract in BP Natural because of its bioavailability (extent and rate of absorption) as well as its punicalagin and polyphenol content. There is some implication that pomegranate extract could also regulate blood vessel dilation&sbquo; which could then in turn control blood pressure. Grape Seed Extract In addition to the studies done&sbquo; many people believe that grape seed extract could be beneficial for cardiovascular health. Grape seed extract is also said to contain a high concentration of vitamin E&sbquo; flavonoids&sbquo; linoleic acid (omega-6 fatty acid)&sbquo; and OPCs (containing procyanidins which can repress the production endothelin-1&sbquo; a protein linked with blood vessel constriction). Japanese Knotweed Root Extract Also called Hu Zhang in China and Mexican Bamboo in North America&sbquo; Japanese Knotweed (polygonum cuspidatum) is a botanical that some people believe can address certain cardiovascular issues. For instance&sbquo; Japanese Knotweed has been used to possibly treat the hardening of arteries and high-cholesterol. Japanese Knotweed extract is also known to feature resveratrol&sbquo; a natural phenol and phytoalexin. Resveratrol has been gaining recent attention as of late due to the possibility that it may be cultivated and utilized for numerous health benefits. Progressive Labs has been a family owned manufacturer and distributor of nutritional supplements for 40 years. Progressive Labs has supplied over 25&sbquo;000 customers with professional grade Vitamins&sbquo; herbals&sbquo; and dietary supplements. These statements have not been evaluated by the Food and Drug Administration (FDA). These products are not meant to diagnoseÃ¢ÂÂ treat or cure any disease or medical condition. Please consult your doctor before starting any exercise or nutritional supplement program or before using these or any product during pregnancy or if you have a serious medical condition. NutriCology Immune Support - ProGreens Stick Pack - Box of 15. The ProGreens&reg; Stick Pack Box of 15 Packets from NutriCology&reg; could help you give your Body a highly comprehensive nutritional support. This dietary supplement offers a special blend of extremely nutritional &quot;superfoods&quot; extracted from organic grasses which may be unavailable from isolated vitamins or mineral concentrates. Furthermore&sbquo; this blend also consists of some very beneficial adaptogenic herbs&sbquo; active probiotics and fiber. Each packet of this product from Nutricology&reg; contains highly essential nutrients such as Proteins&sbquo; Vitamins and Calcium. The organic grasses extracts included in this supplement are in the form of wheat&sbquo; barley&sbquo; alfalfa&sbquo; and oat grass powder. Wheatgrass might help in increasing energy and giving you antioxidant value while barley grass might boost immunity and balance cholesterol levels. Alfalfa grass powder could be useful in detoxifying the body&sbquo; balancing acidic conditions&sbquo; reducing infections&sbquo; boosting slow appetite and a lot more. Besides organic grasses&sbquo; this supplement also consists of adaptogenic herbs which help in increasing metabolism&sbquo; immunity&sbquo; energy and much more. The active probiotics might promote intestinal health and digestion. The fiber contents may maintain bowel health&sbquo; support blood sugar and cholesterol levels&sbquo; and may help achieve healthy weight. The ProGreens&reg; Stick Pack Box of 15 Packets from NutriCology&reg; might be useful in giving you a far-reaching nutritional support. These statements have not been evaluated by the Food and Drug Administration (FDA). These products are not meant to diagnoseÃ¢ÂÂ treat or cure any disease or medical condition. Please consult your doctor before starting any exercise or nutritional supplement program or before using these or any product during pregnancy or if you have a serious medical condition. Pure Encapsulations General Health - Daily Stress Formula - 180. Unfortunately, PureFormulas is not allowed to sell/ship this brand to international destinations. If you're feeling stressed out&sbquo; you probably need more nutritional support. Pure Encapsulations' Daily Stress Formula provides an array of vitamins&sbquo; minerals&sbquo; and herbs to promote a feeling of overall well-being. Ironically&sbquo; preparing healthy foods on a daily basis to ensure sufficient intake may sometimes add another source of stress to your life. In an attempt to save time&sbquo; you may rely on processed foods that are largely stripped of their nutritional benefits. The main ingredient in this supplement is Bacopa monniera extract&sbquo; an Herbal ingredient commonly found in Southeast Asia. It may support healthy enzyme activity in your brain&sbquo; while also promoting better memory and cognitive functioning. Each vegetable capsule also contains rhodiola rosea&sbquo; another herb that may support concentration and lessen fatigue during stressful periods. Both of these compounds may promote learning at school or work. Meanwhile&sbquo; eleuthero may serve as an adaptogen that supports your adrenal glands and immunity. Finally&sbquo; lemon balm and chamomile are widely known for their potential to support relaxation and calmness. Daily Stress Formula also provides essential vitamins and minerals like magnesium to support your metabolism during stressful periods. B complex vitamins&sbquo; especially vitamin B5&sbquo; may support increased energy levels and neurotransmitter functioning. Vitamin C may have antioxidant properties that work to neutralize potentially harmful free radicals that your body's stress response can generate. L-tryosine is an amino acid that may also help your brain work more effectively. Take three capsules daily&sbquo; in divided doses. You can use this supplement either with or between meals. 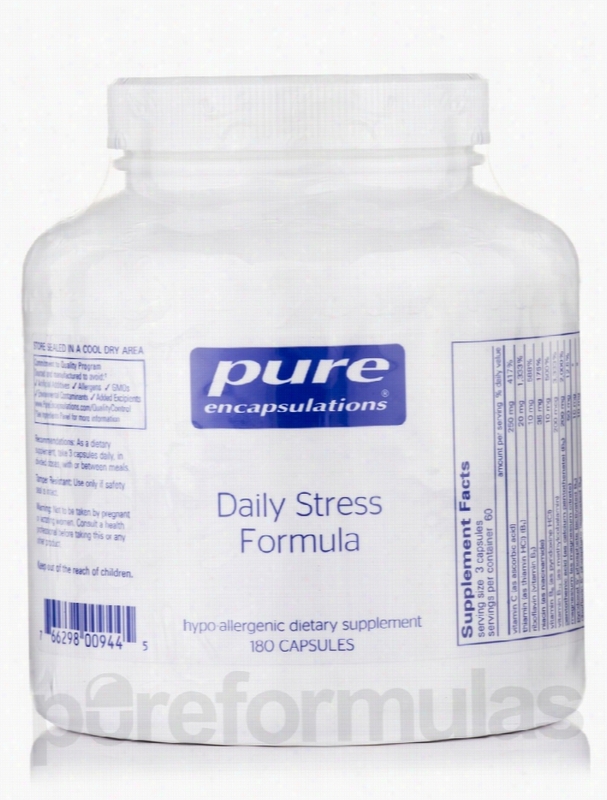 At the recommended dosage&sbquo; each 180-capsule bottle of Daily Stress Formula by Pure Encapsulations should last for about two months. Pure Encapsulations seeks to formulate and manufacture high-quality&sbquo; hypoallergenic dietary supplements. Quality control during the formulation and manufacturing process is paramount. All Pure Encapsulations products are made with the most bioavailable ingredients possible. These statements have not been evaluated by the Food and Drug Administration (FDA). These products are not meant to diagnoseÃ¢ÂÂ treat or cure any disease or medical condition. Please consult your doctor before starting any exercise or nutritional supplement program or before using these or any product during pregnancy or if you have a serious medical condition. 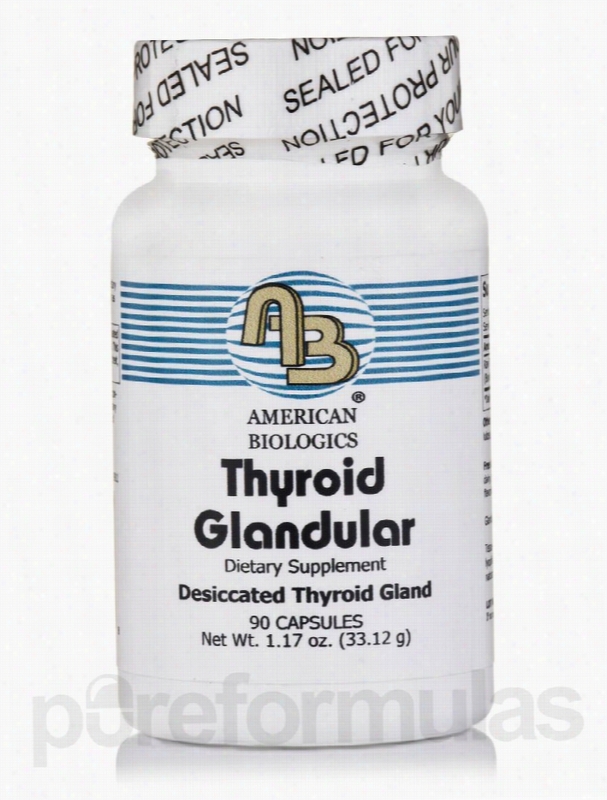 American Biologics Hormone/Glandular Support - Thyroid Glandular - 90. Your thyroid gland&sbquo; which is found near the throat (below the Adam&rsquo;s apple in men)&sbquo; plays a crucial role in metabolism. This gland produces two thyroid hormones&sbquo; L-Thyroxine and triiodothyronine&sbquo; which regulate your body&rsquo;s metabolism. These hormones also work to regulate energy levels&sbquo; as well as how your body uses other hormones and Vitamins. In fact&sbquo; your body can&rsquo;t create new tissue without these hormones! Thyroid problems&sbquo; more common with women than men&sbquo; can lead to either the overproduction or underproduction of thyroid hormones. Overproduction of thyroid hormones is known as hyperthyroidism&sbquo; while underproduction of these hormones is called hypothyroidism. Thyroid nodules or goiter can be quite common in those who have a hormonal imbalance. American Biologics&rsquo; Thyroid Tablets are tried&sbquo; tested&sbquo; and proven under strict scientific conditions to support normal thyroid functions and healthy metabolism. The only ingredient in this supplement is thyroid tissue derived from healthy cattle&sbquo; which can promote hormonal balance. This supplement aims to assist the metabolism of fat&sbquo; protein&sbquo; and carbohydrates&sbquo; including sugar. Thyroid Tablets may also help your body maintain optimal heart&sbquo; brain&sbquo; and metabolic function. A bottle of Thyroid Tablets by American Biologics can last for a month or more&sbquo; depending on the dosage recommended by your health care practitioner. American Biologics&sbquo; a highly respected nutritional supplement company&sbquo; is known for its line of science and evidence-based&sbquo; high-quality nutritional supplements. When it comes to making sound choices for effective nutritional supplementation&sbquo; trust American Biologics to work with the highest purity grades of raw materials and selectively chosen flowing agents&sbquo; while utilizing good manufacturing practices. These statements have not been evaluated by the Food and Drug Administration (FDA). These products are not meant to diagnoseÃ¢ÂÂ treat or cure any disease or medical condition. Please consult your doctor before starting any exercise or nutritional supplement program or before using these or any product during pregnancy or if you have a serious medical condition. Douglas Laboratories Joint Support - Wobenzym PS - 180 Tablets. Sometimes it's easy to forget that the body continues changing after puberty. In fact&sbquo; with the onset of old age&sbquo; we may start to experience pain or discomfort in our joints that we aren't accustomed to. Cartilage can wear away&sbquo; joints can grind together&sbquo; movement can become stiff. These symptoms can sometimes make it hard&sbquo; if not impossible&sbquo; to continue living the lifestyle we enjoy. Douglas Labs understands this discomfort&sbquo; that's why they offer Wobenzym&reg; PS&sbquo; a nutritional supplement that features a blend of ingredients that may offer relief for individuals living with joint pain and/or discomfort. 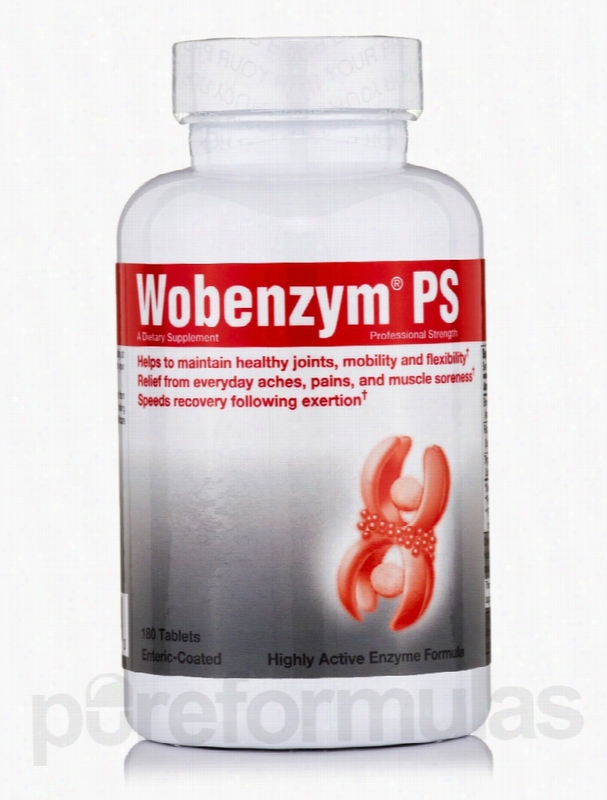 Wobenzym&reg; PS features Bromelain&sbquo; an enzyme derived from pineapples. Studies and evidence suggests that bromelain may promote the production of certain chemicals in our body that could potentially inhibit inflammation. This would be beneficial to sufferers of joint pain because the swelling of the joints can result in prolonged discomfort or mild pain. Another potentially helpful ingredient formulated into Wobenzym&reg; PS is Rutin. This ingredient is a bioflavonoid&sbquo; which is a chemical derived from fruits and vegetables. Rutin may be beneficial because it may feature some antioxidant properties&sbquo; meaning that it may root out and eliminate free radicals. Wobenzym&reg; PS also includes Trypsin. Now&sbquo; the combination of trypsin&sbquo; bromelain&sbquo; and rutin may prove to be beneficial; because some studies suggest that by combining these three ingredients&sbquo; they work synergistically with each other to support joint health. So if you're ready to start supporting your joints&sbquo; consult your healthcare practitioner to see if Wobenzym&reg; PS is right for you. Douglas Laboratories is a pioneer in the field of personalized nutrition. Since its founding in 1955&sbquo; Douglas Labs has been on the leading edge of nutritional technology&sbquo; allowing it to provide superior vitamins and other supplements. All Douglas Labs facilities meet or exceed ISO 9001 &amp; ISO 17025 quality standards. With such attention to safety and use of only the best ingredients&sbquo; you can trust the products that come from Douglas Laboratories. These statements have not been evaluated by the Food and Drug Administration (FDA). These products are not meant to diagnoseÃ¢ÂÂ treat or cure any disease or medical condition. Please consult your doctor before starting any exercise or nutritional supplement program or before using these or any product during pregnancy or if you have a serious medical condition. 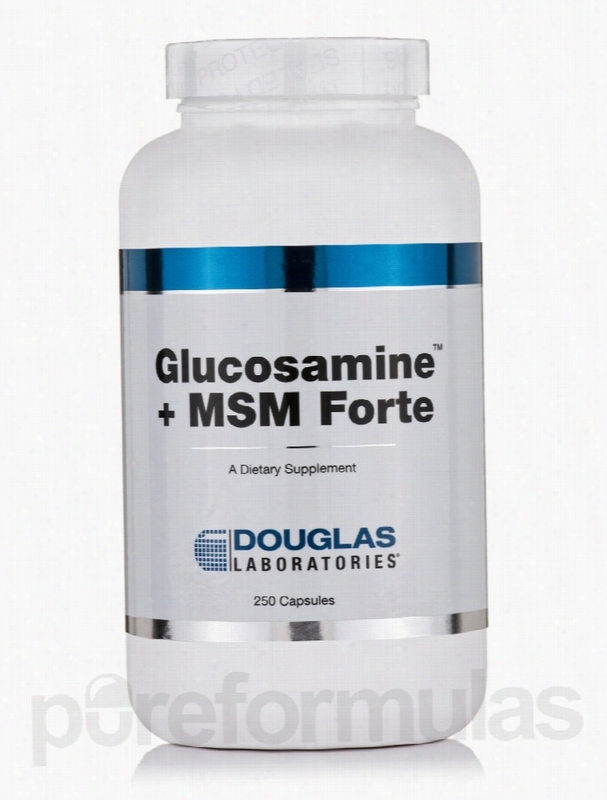 Douglas Laboratories Joint Support - Glucosamine + MSM Forte - 250. Dealing with mild joint pain? There could be several factors that contribute to this - like old age&sbquo; poor nutrition&sbquo; and possibly more. That's why Douglas Labs Glucosamine + MSM Forte Capsules&sbquo; a nutritional supplement formulated to potentially support the healthy function of your joints. Douglas Labs' Glucosamine + MSM Forte Capsules feature glucosamine sulfate&sbquo; a substance that may support healthy cartilage. Cartilage degradation is extremely detrimental to your joints. In essence&sbquo; cartilage acts as a cushion between our joints. Therefore&sbquo; during movement&sbquo; the ends of our bones don't grind together. However&sbquo; if cartilage health is compromised&sbquo; then the cushioning effect of cartilage doesn't function properly. This potentially results in joint discomfort&sbquo; pain&sbquo; and possibly immobility. This supplement is also formulated with MSM (also known as Methylsulfonylmethane). This substance provides a safe&sbquo; dietary form of sulfur&sbquo; which studies and research suggests may promote healthy healthy cartilage. In an effort to alleviate all types of joint discomfort&sbquo; Douglas Labs' Glucosamine + MSM Forte Capsules also features bromelain. This substance is an enzyme that may act as an inflammatory&sbquo; which could possibly help with joint discomfort related to inflamed joints. Glucosamine + MSM Forte Capsules are also formulated with Proanthocyanidins. These substances are generally known as polyphenols - which are called flavonols. These substances are famous for being the Antioxidants within red wine. As an antioxidant&sbquo; these phenols have the ability to eliminate free radicals from the body. Free radicals have been potentially linked to certain health risks. Douglas Laboratories is a pioneer in the field of personalized nutrition. Since its founding in 1955&sbquo; Douglas Labs has been on the leading edge of nutritional technology&sbquo; allowing it to provide superior vitamins and other supplements. All Douglas Labs facilities meet or exceed ISO 9001 &amp; ISO 17025 quality standards. With such attention to safety and use of only the best ingredients&sbquo; you can trust the products that come from Douglas Laboratories. These statements have not been evaluated by the Food and Drug Administration (FDA). These products are not meant to diagnoseÃ¢ÂÂ treat or cure any disease or medical condition. Please consult your doctor before starting any exercise or nutritional supplement program or before using these or any product during pregnancy or if you have a serious medical condition. 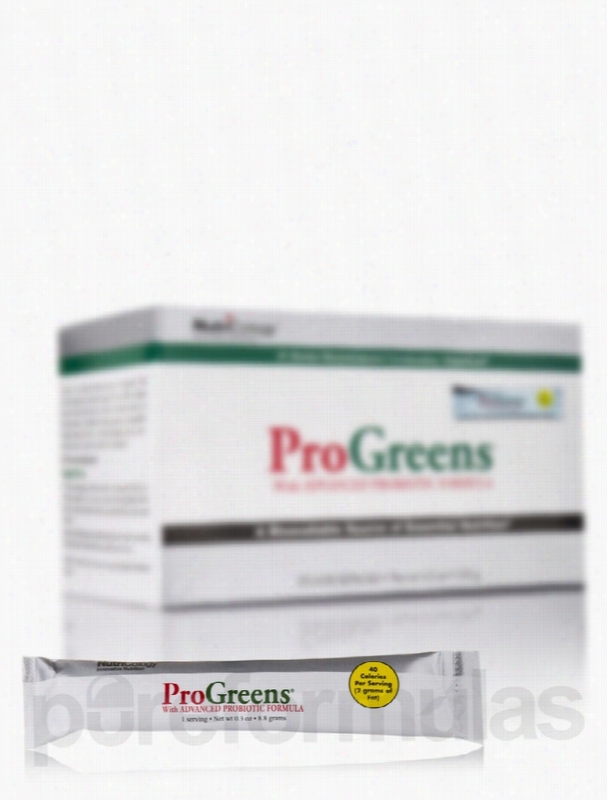 AmaZing Grass Greens and Superfoods - Raw Reserve Greens, Sea. 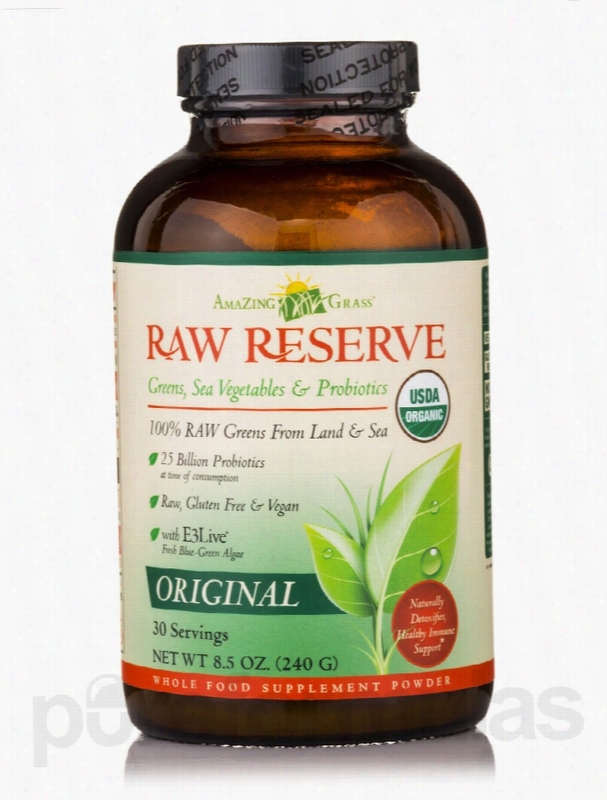 The Raw Reserve (Original) 8.5 oz (240 Grams) from AmaZing Grass is a confluence of nutrition rich ingredients including algae&sbquo; cereal grasses&sbquo; sea vegetables and other functional foods. It is known to contain an array of free radical fighting plants and herbs&sbquo; which may promote Nutritional health. A daily intake of this superfood may offer the entire range of nutrients like vitamin C&sbquo; vitamin K&sbquo; protein&sbquo; sugars&sbquo; calcium&sbquo; etc. This dietary formula from AmaZing Grass can help in enhancing and supporting the nutritional conditioning of the human body. A regular intake may assist with general body maintenance and health. The blend of cereal grasses&sbquo; spirulina&sbquo; chlorella&sbquo; sea vegetables (like kelp and sea lettuce) found in this formula may promote nutritional support of your body. This dietary supplement is a USDA certified organic product and is free from Gluten. Get the Raw Reserve (Original) 8.5 oz (240 Grams) from AmaZing Grass and support the overall health and wellness of your body. These statements have not been evaluated by the Food and Drug Administration (FDA). These products are not meant to diagnoseÃ¢ÂÂ treat or cure any disease or medical condition. Please consult your doctor before starting any exercise or nutritional supplement program or before using these or any product during pregnancy or if you have a serious medical condition. 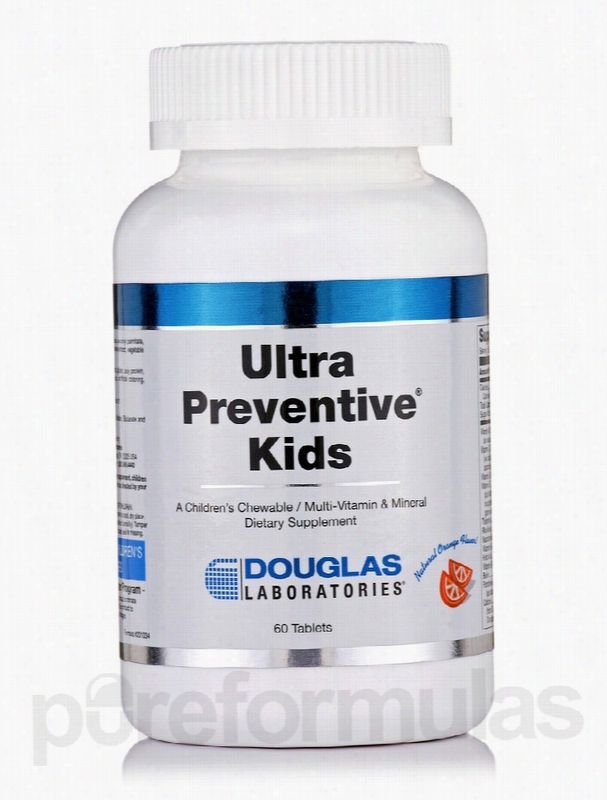 Douglas Laboratories Children's Formulas - Ultra Preventive Kids. Douglas Labs&rsquo; Ultra Preventive Kids Orange Flavor 60 Bear Shaped Tablets Looking for a way to make vitamins fun for kids? Getting our youngsters in the habit of taking their vitamins can be a real challenge sometimes. Douglas Labs wants to make it fun&sbquo; easy&sbquo; and healthy with Ultra Preventive Kids Bear Shaped Tablets. Douglas Labs&rsquo; Ultra Preventive Kids tablets provide the kind of comprehensive nutritional support you&rsquo;d expect from Douglas Labs in a tasty orange flavored bear shaped chewable. They are designed for kids ages four and up to give growing bodies what they need for proper nutrition. Ultra Preventive Kids tablets provide 28 nutrients like important Antioxidant vitamins C and E. They provide a complete array of B-complex vitamins along with bioavailable magnesium and calcium. All of these nutrients can support potential improvements in health functions&sbquo; energy production&sbquo; antioxidant support&sbquo; and more. These tasty and fun orange flavored chews make it a fun addition to a child&rsquo;s healthy nutritional routine. Douglas Labs&rsquo; Ultra Preventive Kids Bear Shaped Tablets contain NO yeast&sbquo; wheat gluten&sbquo; soy protein&sbquo; milk/dairy&sbquo; corn&sbquo; sodium&sbquo; sugar&sbquo; starch&sbquo; artificial coloring&sbquo; preservatives or flavoring. Order today! We&rsquo;re sure kids will love this tasty and convenient way to get the nutritional support they need for health and growth. These statements have not been evaluated by the Food and Drug Administration (FDA). These products are not meant to diagnoseÃ¢ÂÂ treat or cure any disease or medical condition. Please consult your doctor before starting any exercise or nutritional supplement program or before using these or any product during pregnancy or if you have a serious medical condition. 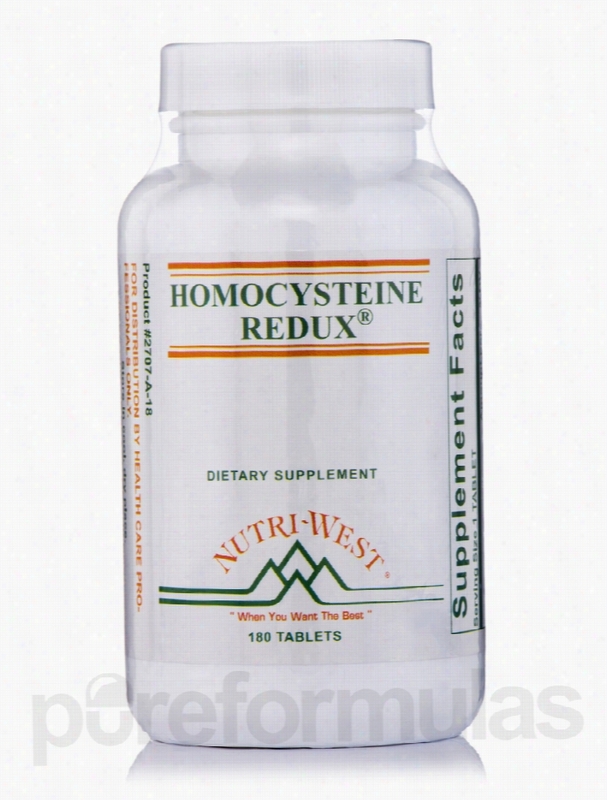 Nutri West Cardiovascular Support - Homocysteine Redux - 180 Tablets. Many discussion about cardiovascular health inevitably end up bringing up homocysteine&sbquo; a non protein based amino acid. Some research and scientific evidence suggests that homocysteine may negatively impact cardiovascular health. Sources of homocysteine are primarily meats. Therefore&sbquo; a diet consisting of mainly meats and very little fruits and/or vegetables may result in high levels of homocysteine. That's why Nutri West has formulated Homocysteine Redux&sbquo; a dietary supplement featuring a wide array of ingredients like vitamins&sbquo; minerals&sbquo; and more that may help lower homocysteine levels in the body. Here are some of the ingredients you'll find in Homocysteine Redux: Vitamins B6 &amp; B12 These nutrients are called essential vitamins&sbquo; which means they are absolutely necessary for sustaining life&sbquo; but we can't produce them naturally; they must be ingested. Ideally&sbquo; if one ate a healthy&sbquo; balanced diet&sbquo; then one would get the proper amount of nutrients that they need. However&sbquo; reality is more inclined to suppose that most people don't eat healthy as a result of hectic work schedules and easily available foods that lack proper Nutrition. Homocysteine Redux provides vitamins B6 &amp; B12 because these two essential vitamins work to convert homocysteine in the body to methionine&sbquo; an amino acid that may support liver health. Magnesium This essential mineral plays a role in supporting the healthy function of numerous parts of the body. For instance&sbquo; magnesium seems to be necessary for maintain bone&sbquo; nerve&sbquo; and muscle health. Since magnesium may have potential benefits for the cardiovascular system&sbquo; it may affect homocysteine levels. Homocysteine Redux features many more ingredients. Click the &quot;Ingredients&quot; tab at the top for a detailed list. Always consult your healthcare practitioner before starting any new dietary or nutritional supplement. Nutri West provides nutritional supplements to health care professionals in order to optimize their patients&rsquo; well-being. It was founded in 1981 and has expanded into a worldwide company with state-of-the-art&sbquo; environmentally-friendly manufacturing and packaging processes. Its products are hypo-allergenic and have been formulated for the highest quality. These statements have not been evaluated by the Food and Drug Administration (FDA). These products are not meant to diagnoseÃ¢ÂÂ treat or cure any disease or medical condition. Please consult your doctor before starting any exercise or nutritional supplement program or before using these or any product during pregnancy or if you have a serious medical condition. Priority One Metabolic Support - Enzy-Gest - 250 Tablets. Enzymes are critical for digestion: they help you absorb the nutrients contained in the food you eat. Proper digestion requires eating foods that are rich in enzymes (like raw foods) and chewing food properly. These are habits that many people don't practice on a regular basis. Priority One's Enzy-Gest is a supplement that increases your enzyme intake&sbquo; therefore easing digestion. B vitamins perform many important functions&sbquo; including converting food into energy and reducing the risk of major birth defects in pregnant women. They also promote the absorption of other nutrients such as iron&sbquo; making you less likely to develop anemia (an iron defiency). They also help lessen uncomfortable PMS (premenstrual syndrome) symptoms in women. You might be familiar with the downsides of not maintaining sufficient levels of B complex vitamins in your diet; these include fatigue&sbquo; loss of appetite&sbquo; trembling&sbquo; and irritability. Incorporating vitamin B into your diet or supplement regimen can have marked effects on all these issues&sbquo; while helping sustain your general health. Fortunately&sbquo; Enzy-Gest tablets provide both essential groups of nutrients: Pepsin and pancrealipase&mdash;digestive enzymes that aid in the digestion of proteins&sbquo; carbohydrates and fats. Vitamin B&mdash;a vital component for cellular energy production&sbquo; numerous enzymatic reactions&sbquo; and the health of your vital organs. Amylase&mdash; an enzyme produced by your salivary glands and pancreas&sbquo; which aids in the digestion of dietary starches. Bromelain&mdash; an enzyme found in the stems of pineapples that breaks down proteins. Pancreatin&mdash;a combination of pancreatic enzymes that can be used as a supplement when your pancreas doesn&rsquo;t secrete enough enzymes in order to digest the food you eat. 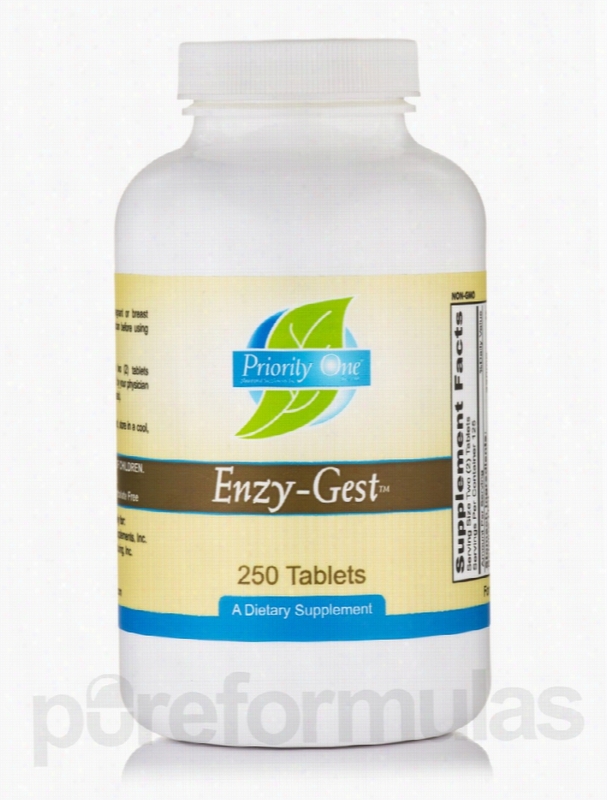 Each bottle of Enzy-Gest by Priority One contains 250 tablets&sbquo; which is enough to last for up to 40 days&sbquo; depending on your dosage. As a manufacturer of high-quality natural health and nutritional Products&sbquo; Priority One is committed to serving health care professionals and patients. Priority One is a family-owned and operated company that was established a quarter of a century ago. Its focus is on developing potent&sbquo; safe&sbquo; and effective nutritional supplements that enhance the lives of users. These statements have not been evaluated by the Food and Drug Administration (FDA). These products are not meant to diagnoseÃ¢ÂÂ treat or cure any disease or medical condition. Please consult your doctor before starting any exercise or nutritional supplement program or before using these or any product during pregnancy or if you have a serious medical condition.